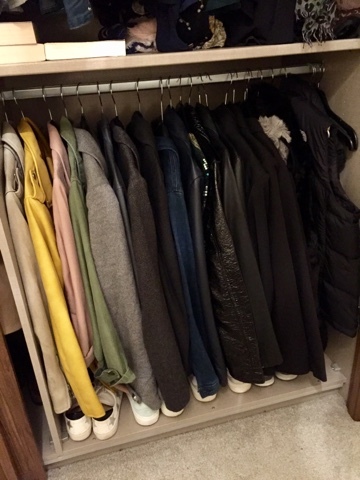 I'm asked all the time about how much clothing I have and where I store it so last week when I did my AW changeover and a massive tidy and clear out, I immediately took ALL the photos - the chances of it staying tidy for more than 24 hours was low. 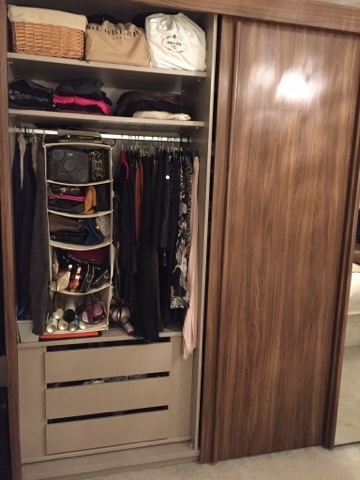 Back to the wardrobe and when we moved, I was being quoted in or around £3k for a 3 metre built in wardrobe that would have had to stay in the room forever. 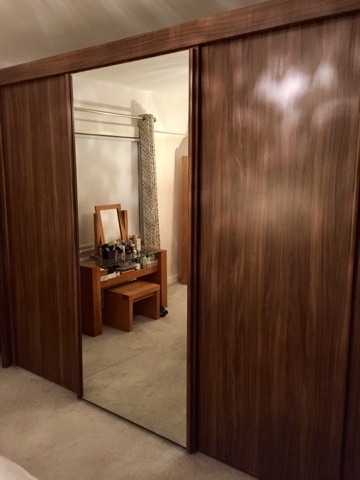 This was around £800 and it's not fully built in - it's just fixed to the wall temporarily, meaning neither my carpet nor the original picture rail had to be cut. It also means that if I take the notion, I can move it to another room or we can bring it with us if we ever move. 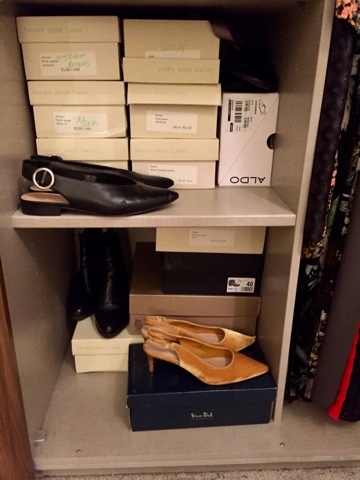 So taking it section by section, I'm starting with the middle and on the top I store my going out shoes and my long boots - both of which I wouldn't really wear as often as my other shoes, which are all on the two lower shelves. Between these, I store my folded items. 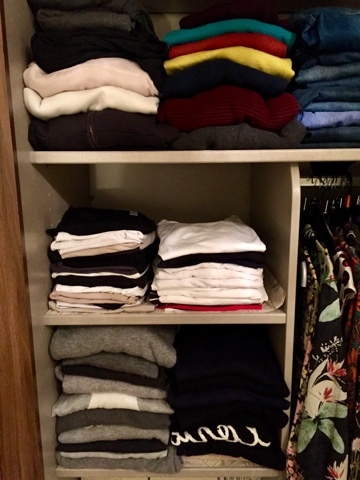 Larger knits and jeans/trousers (that don't need hung up) on the top, t-shirts/vests in the middle and lighter weight knits - including my impressive collection of grey knits - on the bottom. And moving onto the shoes I do wear daily - apart from the yellow slingbacks...which are just too beautiful to be out of sight. I store ankle boots on the bottom shelf and brogues, loafers and slip ons on the top. As winter gets colder, the likes of those black slingback flats will go into storage but they're a great shoe for wearing at the moment. On the 1 meter stretch on the left, I've a drawer section which contains socks/hosiery/lingerie and nightwear. The hanging section above it wasn't practical enough for me so I added in this canvas hanging set of shelves but they need replaced as they're all out of shape. I'd like to get a small shelf unit from Ikea to put here - that's on my list for the next visit. On the hanging rail, I have skirts, culottes and formal trousers, along with some chunky long cardigans (on the left). Above my hanging shelf, I store large handbags, gym gear and the basket has keepsakes from the kids and some scarves and clutches that are a bit old fashioned but that I want to keep for my daughters as they have sentimental value. 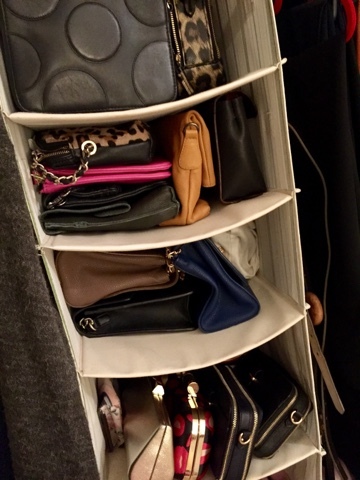 On the (dying) shelf unit, I keep my smaller handbags and clutches - the ones I use most frequently. I really need to have my bags on show like this as otherwise I forget about them and get lazy about changing them regularly. Even as I tidied up this section, I found one I'd totally forgotten about! Now it's probably a good time for me to say here that I have a bit of a handbag issue...I'm a sucker for a cross body bag (can you tell?). I've been fortunate to be gifted some of them but the majority were purchased by myself over the years and I've used every one of them several times (and many of them lots of times) in the past 12 months. Then moving to the right hand side where I've two hanging rails with a shelf above. The shelf has a winter bag I've not yet emptied as it contains all my heavy blanket scarves and gloves/hats etc. I wish I had an amazing solution for you for storing all of these - I don't. I'm actually so reluctant to open this bag as I've no idea where It'll go. I'll possibly get a big basket for putting on the floor beside the wardrobe? Watch this space. On the top hanging rail I've got shirts, blouses, tops and lightweight scarves, on an Ikea scarf hanger....oh and some books I've not yet got round to reading. Random. On the bottom shelf, it's jackets and check me lining them up in colour order, light to dark. I give it a week before these are back to how they were. And that is it - apart from my choir gear (2 cardigans and 2 formal gowns). Here's where I fess up to stealing some of my son's wardrobe for these. They're wrapped in covers to protect them and I'm pretty sure he's not even noticed that they are there. He never hangs anything up. I'm not even sure he is aware of a hanging section in his wardrobe. He's somewhat aware of a floor-drobe and happily dumps most of his gear there. So have I more than you thought? Or less? When I posted some pictures on Instagram Stories the night I tidied it, I had some incredulous messages telling me I had a ridiculous amount of clothing. 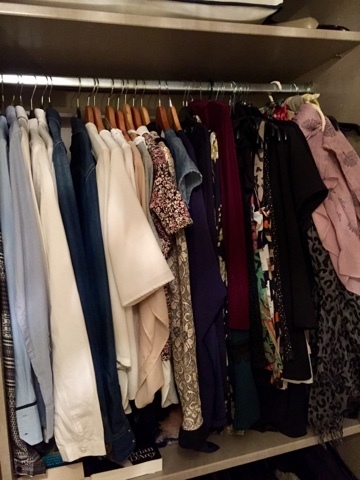 It kind of made me sad as I know I've LOADS less than many of my friends and I've seen big bloggers share their wardrobes which are entire rooms sometimes!! But it did get me thinking and whether it's the tidy up and organisation, or the comments, I've consciously avoided the shops since. It won't last though...you'd miss me and all my shopping I'm sure. What I will say about what I have is that I work it hard. There's nothing in that wardrobe that hasn't been worn in the last year and at leat 50% of it has been worn on many occasions. I don't keep anything that doesn't get worn. 1. Keep day to day clothing visible. Don't put anything in behind folded items & don't double hang. 2. Keep day to day items at eye level and below. Move formal items like gowns and sparkly heels upwards and to other wardrobes. 3. Take all your bags out of dustbags so you can see them (following on from Point 1) Remember to tuck straps inside the bags to prevent damage. Use folded dust bags between the bags to prevent damage. 4. 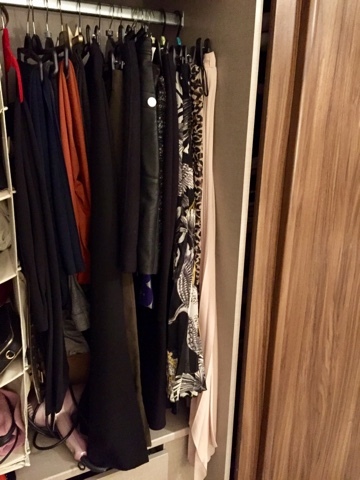 Use slim velvet hangers - the consensus seems to be to get them in TK Maxx (not Primark apparently....I have had SO many messages about this!). 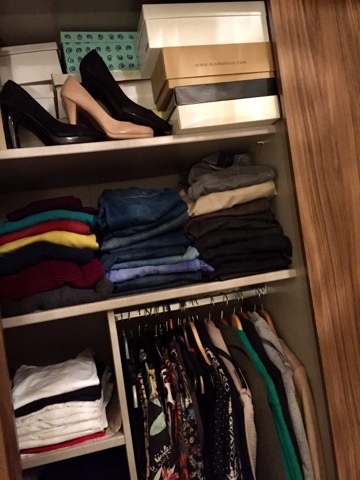 This will release about 30% more space in your wardrobe when compared to wooden hangers. Oh and buy twice as many as you think you need....I made that mistake myself. 5. Less is More - One in/Two Out. The biggest issue I see with friends is that they keep buying cheaper pieces and never make room for them. This leads to indecision brought on by the amount of choice in their wardrobe. 6. If it's not being worn GIVE IT AWAY! Guilt from not wearing clothes creates a negativity about your wardrobe. If you give it away to a willing recipient, be that charity, a friend or to a consignment shop, you will immediately feel amazing and I guarantee, you won't miss the item. You will instead welcome the room created in it's space! 7. 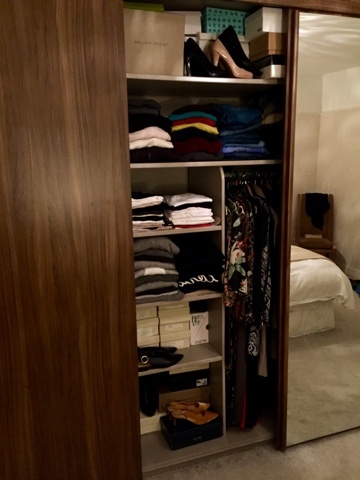 Stop using a wardrobe in another room - this is just license to buy more and keep more. If you don't have the room, you won't keep as much. This is not an exhaustive list - there are SO many more aspects to this and I've not found the magic formula myself. I still get tempted by the sale bargain and forget that I already have something similar. But by cutting down my wardrobe and not succumbing to the temptation of space in my son's wardrobe, I've managed to be more ruthless and less spendy.